During the 2016-2018 academic years, Maribel Morey will be on leave as an Andrew Carnegie Fellow. She is a twentieth-century U.S. historian with particular interests in the history of U.S. philanthropy, the sociology of knowledge on race and ethnicity, and public policymaking on minority groups. Currently, she is working on two book manuscripts detailing elite foundations' changing approaches to racial inequality in the United States throughout the span of the twentieth century. Maribel's work has been published in journals such as Law, Culture, & the Humanities, New York University Law Review, and Reviews in American History. 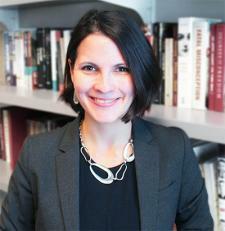 She is a co-founder and editor of HistPhil, a new web publication on the history of philanthropy. She is also a contributor for The Atlantic Online and Stanford Social Innovation Review. For more information on Maribel Morey, please go to http://www.maribelmorey.com.